My daughter loves to dress up in the latest styles for little girls and she always prefers to wear the prettiest and most feminine dresses. Occasionally, we find a dress that is simply exceptional in terms of quality and style which is exactly what we found at Infinity for Girls! 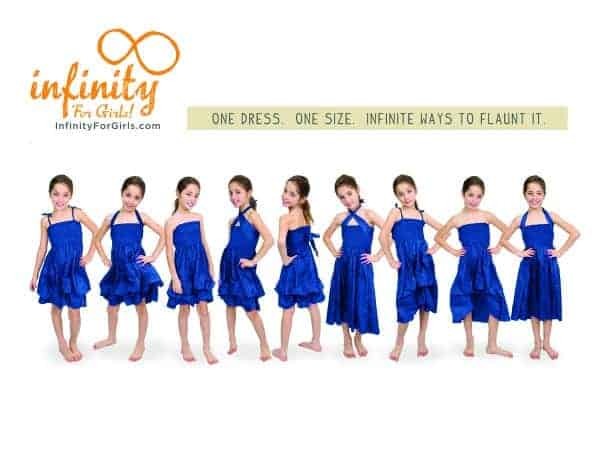 What makes the dresses at Infinity for Girls for special? 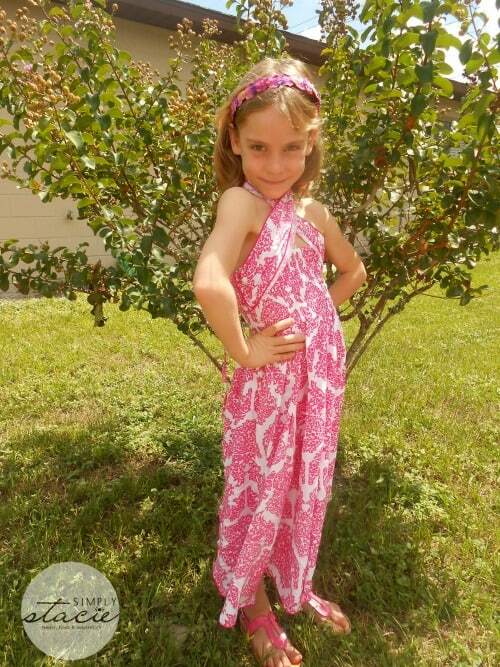 Your little girl is sure to feel amazing when wearing the Infinity which is “One Dress. One Size. Infinite Ways to Flaunt It.” The Infinity dress is available in a variety of fashion forward colors and prints. I love that it can be worn in so many different ways and it is a value in terms of quality, creativity and the fact that it can grow along with Hannah. 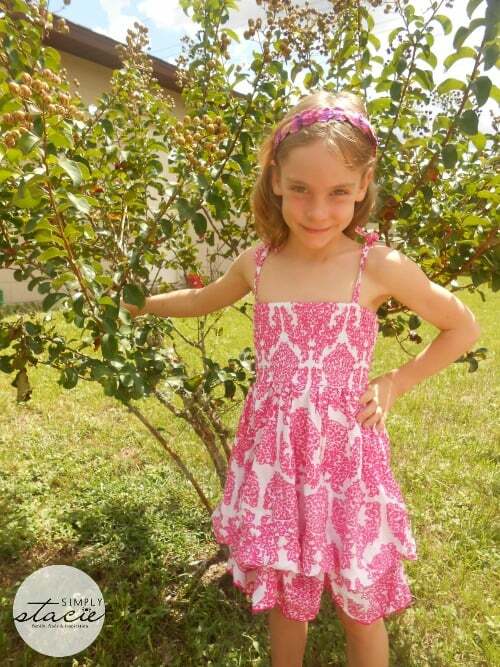 The Pink Damask Infinity ($98) is stunning and Hannah has declared it her “most favorite dress in the world”. She beams with pride when wearing it and we have received lots of compliments when she is wearing it out on the town. Because of the special design (fits from ages 4-10), this dress is sure to be worn by Hannah for years to come and I am confident that it will be a much loved dress in her wardrobe. For example, Hannah can choose to wear the strappy full skirted sun dress with the skirt down so she can twirl around with a billowing skirt or she can tie it up with the built in straps underneath for an entirely different look. The top of the dress can be tied with the sun dress straps or your little girl can choose to wrap the additional fabric to tie it in different styles or even wear it strapless. The feminine ruched bodice is very comfortable to wear even for children with sensitive skin like Hannah’s and we love the exquisite soft 100% rayon fabric too. It is easy to care for as I simply hand wash it and lay it flat to dry. 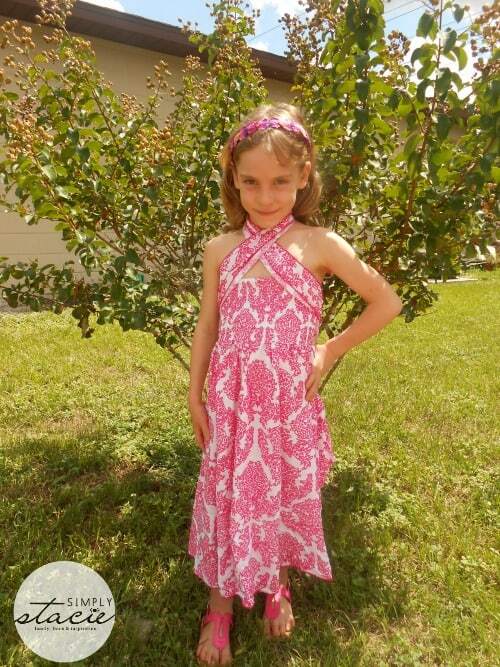 Young fashionistas are sure to love the Infinity dress collection as much as my Hannah loves her Pink Damask dress. These dresses would be perfect for special occasions or to dazzle over the holidays and can be paired nicely with a pretty cardigan. You are invited to visit Infinity for Girls to browse the entire collection of gorgeous dresses for young ladies! Connect with Infinity for Girls on Facebook, Twitter and Pinterest too! What a great idea, and so cute. I also love the Pink Damask Infinity. wow I love all the different ways and the print. how cute my 6 year old daughter would love it. I love the colors and how it can be a different style dress if she wanted. What a great idea! The dress is really cute. You have quite the cute model too! Fabulous concept! Thank you for telling us about Infinity for Girls! Hannah is adorable in these photos! Awe so adorable and awesome idea!! Your daughter is beautiful and I love the dress!! I love this idea! The dress can easily be changed for different looks and ages. I like this effect in bridesmaids dresses, too. She looks adorable, and you can tell she loves the dress.